If you’re already making a meal (such as pancakes, quesadillas, mac and cheese, soup) simply double the recipe so you can enjoy the meal now and freeze the extras for later. If you’re already making a mess in the kitchen, and the ingredients are already out on the counter, why not multiply your effort. We already talked about make-ahead breakfast ideas, so let’s move on to the lunchbox. You’ll notice that many of the make-ahead lunch ideas are freezer-friendly options. Along with indicating if a meal is freezer-friendly, I’ve also provided my recommendations for reheating foods. I use a microwave or the stove-top for most of our reheating needs. 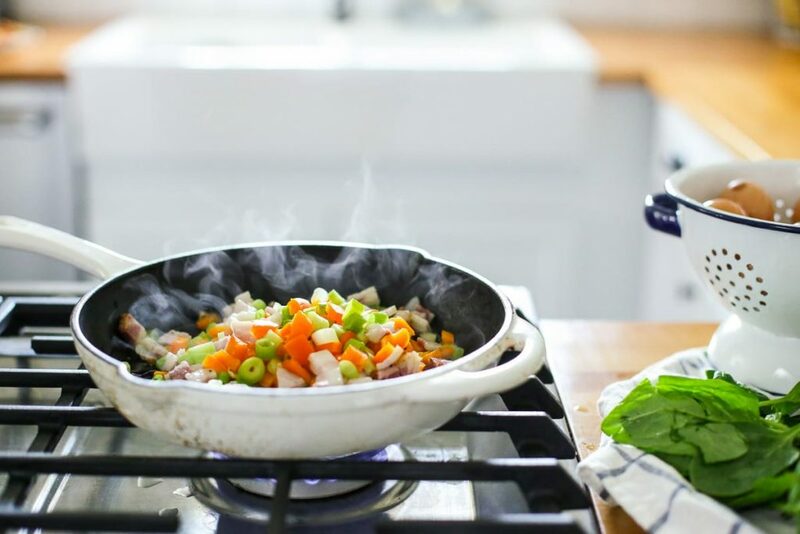 Not everyone uses a microwave, so do what’s best for your family and experiment ahead of time with the best way to reheat your family’s favorite breakfasts. When it comes to freezing foods, I don’t have a lot of space in my freezer so I freeze my food in plastic freezer bags. The bags are reused over and over again. When I run out of quesadillas, I make more quesadillas and place them in the same bag. 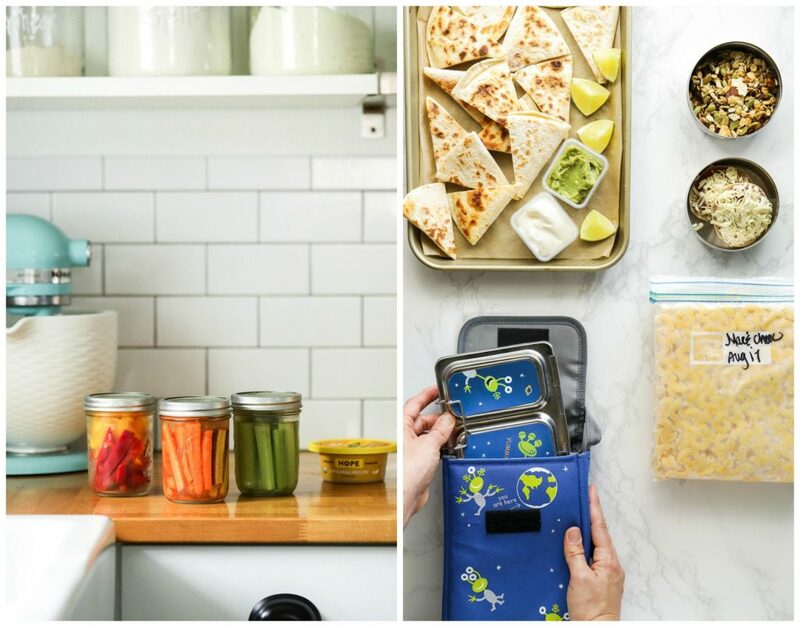 If you have a lot of freezer space and you want to use glass containers, make sure the containers are freezer-safe. Always make sure your food has completely cooled before placing it in a bag (or container) and placing the bag in the freezer. If you’re worried about foods sticking together, freeze the food on a parchment-lined baking sheet for about an hour, then place the food in a bag. Most of the items below are packed in a Planetbox and served at room temperature. For a few items, like spaghetti and soup, I’ll use a thermos to keep the food warm. For cold items, like the fruit and yogurt, I use the Planetbox Big Dipper in the main compartment of the Planetbox. I always pack an ice pack in the lunchbox, which helps keep the food safe until lunchtime. This post goes into detail about my favorite gear. I don’t pack lunches ahead of time; I simply prep different food options in advance. I always pack lunch in the morning, while the kids are busy making their beds and getting dressed (hack #4). 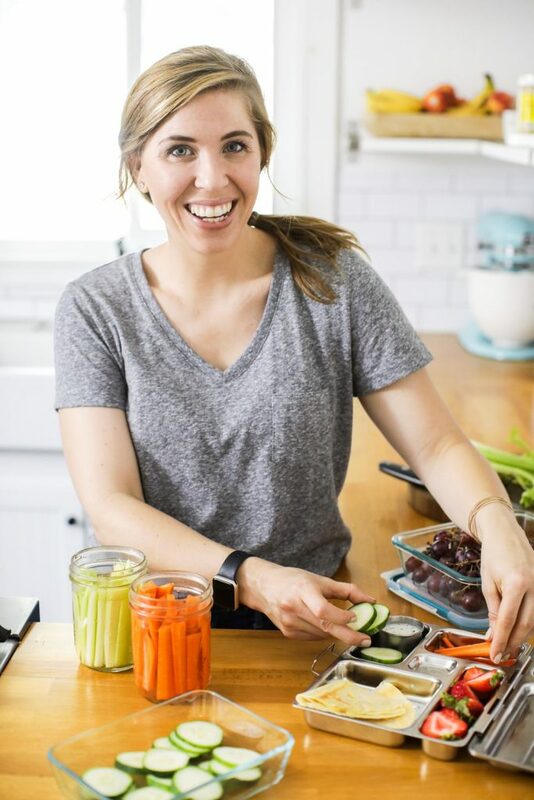 And one note about my personal lunchbox philosophy…I’m all about packing foods I know my kids will actually eat and enjoy. I don’t consider lunchtime, at school, a time to experiment with new foods. New foods/recipes are introduced at dinner or at the weekend breakfast table. This a great sauce to make on the weekend and enjoy throughout the week for lunch or dinner. Store the sauce in the fridge for about 4 days, or in the freezer for 3-4 months. If you’re purposely making the sauce to freeze for later, I recommend adding the cheese after defrosting and reheating. Reheat the sauce in the microwave or a saucepan (over low heat) and mix it with pasta noodles. Pack the spaghetti sauce and noodles in a thermos. Spoon pizza sauce (I go with store-bought sauce) over small sliders or pitas (I use Ozery Bakery Multi-Grain Sliders), then top each pizza with shredded mozzarella cheese. Freeze the pizzas on a parchment-lined baking sheet. Once frozen, carefully slide the pizzas into a bag (separating the layers with parchment paper). Reheat the pizzas (as many as desired) in an oven (400F) until the cheese fully melts. Add shredded chicken to a taco themed lunch, make a chicken salad, add the chicken to a tortilla to create a wrap, or mix the shredded chicken with rice (and a small amount of butter, if desired). Freeze the shredded chicken in a bag (or container) and defrost it in the fridge overnight. Warm the chicken in a skillet (with a bit of butter or oil) or reheat it in the microwave. Chicken or tuna salad can be prepped in advance and stored in the fridge for up to 3-5 days. In the morning, spoon the prepared salad over bread, in a wrap, or in lettuce leaves or bell peppers. Or, serve the salad alone with some crackers (I like Jovial and Simple Mills), plantain chips, pita slices, or pretzels. Cook black or pinto beans in the Instant Pot. Once the beans are cool, spoon them into freezer bags and store the bags, flat, in the freezer. To reheat the beans, place the bag in warm water and allow the beans to defrost (do this while you’re getting ready in the morning), then pour the beans into a saucepan and warm over medium heat. My kids enjoy a weekly “build your own taco” lunch theme, so the beans usually accompany rice, shredded cheese, a tortilla or tortilla chips, and guacamole or salsa. Make a pot of rice. Once the rice is cool, spoon it into freezer bags and store the bags, flat, in the freezer. To reheat the rice, place the bag in warm water and allow the rice to defrost (do this while you’re getting ready in the morning), then pour the rice into a saucepan over medium heat, adding a bit of water to keep it from drying out. My kids enjoy a weekly “build your own taco” lunch, so the beans usually accompany rice, shredded cheese, a tortilla or tortilla chips, and guacamole or salsa. Add shredded cheese to one side of a tortilla, fold the tortilla over the cheese, and then cook the quesadilla in a skillet, or a griddle for multiple quesadillas at one time, with a bit of oil, flipping the quesadilla once. Allow the quesadillas to cool, then place the quesadillas on a parchment-lined baking sheet. 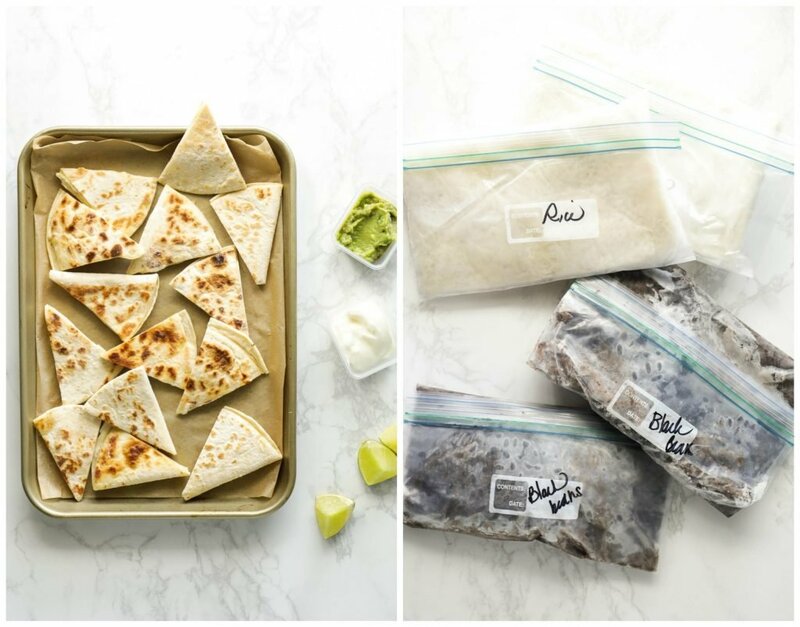 Freeze the quesadillas for about 30 minutes-1 hour, then cut the quesadillas into smaller pieces (thirds) and store them in a bag in the freezer. Reheat the quesadillas in a skillet or the microwave. The same goes for grilled cheese. I like to cut the grilled cheese in half, after the initial freeze on the sheet pan. Both grilled cheese sandwiches and quesadillas are perfect to serve with a thermos of soup. Make a bunch of nut butter (or seed butter, if your school is nut-free) and jam sandwiches in advance, wrap them in parchment paper, and freeze them in a gallon-size bag. There’s no need to defrost a sandwich in advance. The sandwich should defrost in the lunchbox. A fun real food take on the classic corndog. Store the muffins in a freezer bag or container. Defrost as many muffins as desired in the fridge overnight, or reheat them directly from the freezer using the microwave or oven. Serve them with ketchup or mustard. Make a pot of macaroni and cheese, allow it cool in the pot, and then spoon the mac and cheese in quart-size bags. 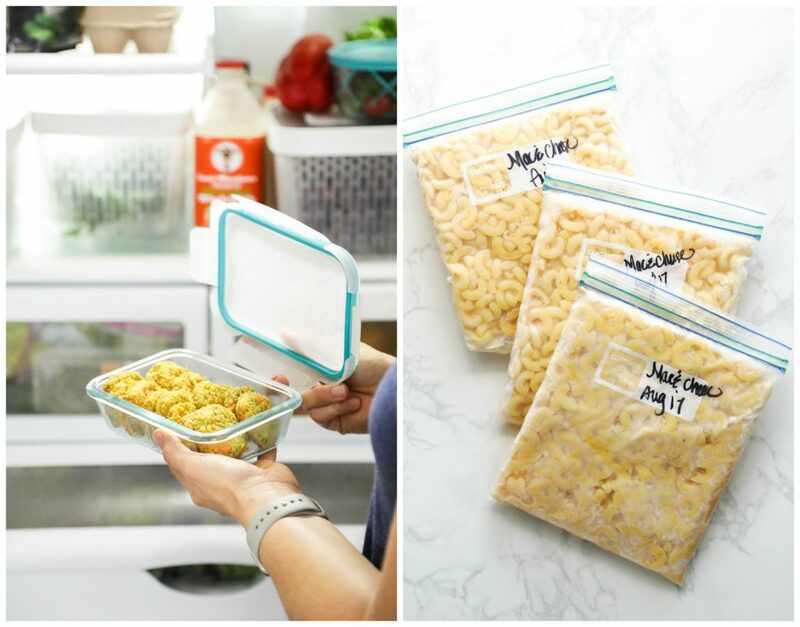 Freeze the mac and cheese, flat, in the bags. To reheat the mac and cheese, place the bag in warm water and allow the noodles to defrost (do this while you’re getting ready in the morning), then pour the mac and cheese into a saucepan, with a bit of extra milk, and warm the noodles over medium heat. Remember to gently stir the mac and cheese while it’s warming up in the saucepan. My kids love pasta, especially in their lunchbox. Pasta salad takes pasta from just plain ol’ noodles (which I also send in a thermos, along with butter and parmesan cheese) to a veggie-packed meal. Make a pasta salad on the weekend (maybe double the recipe so you can also serve some for lunch on Sunday) and store the salad in a container in the fridge. If you’d like to go the homemade route with chicken nuggets or tenders, I recommend making a batch on the weekend, keeping them in the fridge and reheating them in the microwave or toaster oven. I usually place the tenders directly from the fridge into the lunchbox, so the kids enjoy the tenders at room temperature. For a store-bought option, I like Belle and Evans or Applegate. Make a large batch of just one soup every weekend. Plan to serve the soup for lunch or dinner, and then store the leftovers for a quick lunchbox addition. This post breaks down how to store soup in the freezer and reheat soup for school lunches. 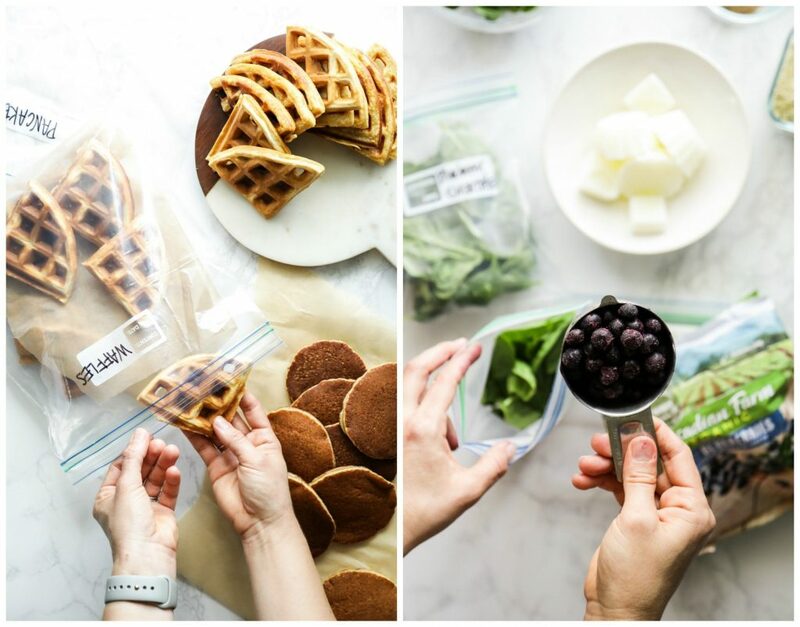 Pancakes and waffles are a favorite breakfast and lunch option with my kids, so I usually make a double batch (double the recipe) once every few weeks and keep extras in the freezer. Once cool, I freeze the pancakes in a gallon-size plastic bag, with parchment paper separating the pancake layers (to prevent sticking). Reheat pancakes in the microwave, a skillet, or a toaster oven. Pancakes can also be kept in the fridge for up to a few days. The pancakes can be packed with a side of maple syrup (in a small, leak-proof container) or made into sandwiches (try cream cheese and jam or sliced strawberries, or nut butter and jam or sliced strawberries or bananas). I also make a double batch (double the recipe) of waffles every few weeks and keep extras in the freezer. Once cool, I freeze the waffles in a gallon-size plastic bag, with parchment paper separating the waffle layers (to prevent sticking). Reheat waffles in the microwave, toaster, or a toaster oven. Waffles can also be kept in the fridge for up to a few days. The waffles can be packed with a side of maple syrup (in a small, leak-proof container) or made into sandwiches (try cream cheese and jam or sliced strawberries, or nut butter and jam or sliced strawberries or bananas). Or, go savory with the waffle sandwiches with sliced turkey or chicken salad. In a quart-size bag, combine your favorite frozen fruits and/or veggies, some (fresh) greens (if desired), and anything else you’d like (frozen kefir cubes, collagen peptides, bee pollen, flax seeds, and/or hemp seeds). Freeze the bag. When you’re ready to make a smoothie, pour the smoothie pack contents into a blender, add water (about 1-2 cups), and blend. For school lunch, pour the smoothie into a thermos. I’ve also been thinking about purchasing a squeeze pouch (like this) for school smoothies. 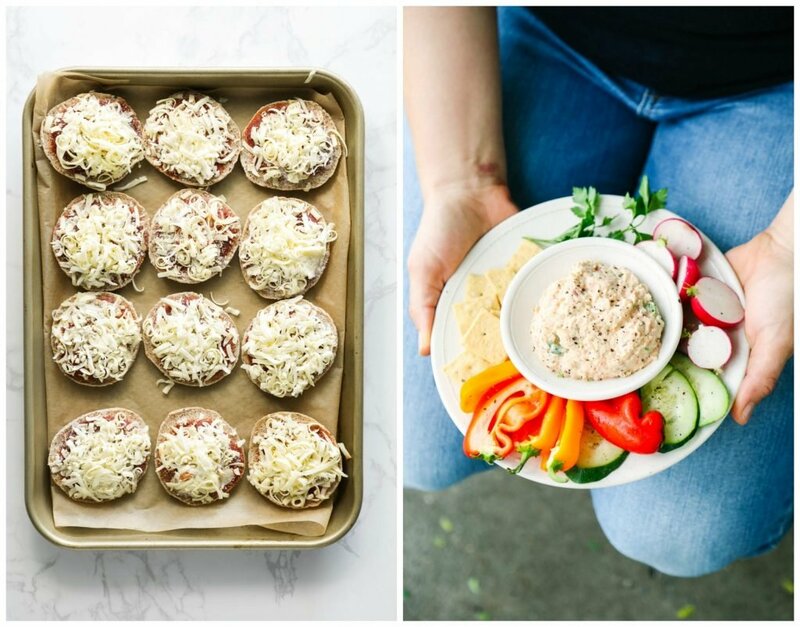 Muffins can be paired with soups, hardboiled eggs, a salad, yogurt, or served with sliced veggies and a dip, and cheese slices for a finger food lunch. Add butter, a nut or seed butter, or coconut butter (like this) for a nourishing fat. I shared an entire post on how to freeze muffins, here. Reheat muffins in a toaster oven or microwave. Baked oatmeal cups are made with oats, applesauce, banana, or pumpkin puree, a bit of sweetener, some milk, and any add-ins (chocolate chips, fruit, etc.). The final result is muffin-style, portable oatmeal. Once cool, oatmeal cups can be stored in the freezer (I keep them in a gallon-size bag) for up to several months, or stored in the fridge for up to a week. Serve the oatmeal cups at room temperature. Oatmeal cups can be paired with soups, hardboiled eggs, a salad, yogurt, or served with sliced veggies, a dip, and cheese slices for a finger food lunch. Wrap the individual burritos in parchment paper and then store the burritos in a gallon-size bag. Reheat the burritos in the microwave or oven. For small kids, a large burrito may be too much for lunch, so try making smaller burritos with fajita-size tortillas. Fruit and yogurt cups can be prepped in advance using mason jars (I go with 4 or 8-ounce jars) and then stored in the fridge for up to 4 days. If you love fruit-on-the-bottom style yogurt, go with frozen fruit since it will defrost in the fridge, resulting in the best fruit-sweetened yogurt. Add the yogurt and fruit to a lunchbox appropriate container (I use the Planetbox Big Dipper). Add some homemade granola on the side (from the freezer or fridge). I’ll be sharing a new granola recipe next month–it’s made with cacao nibs, apricots, and cherries. It’s also nut-free. There are currently three bags sitting in my freezer. 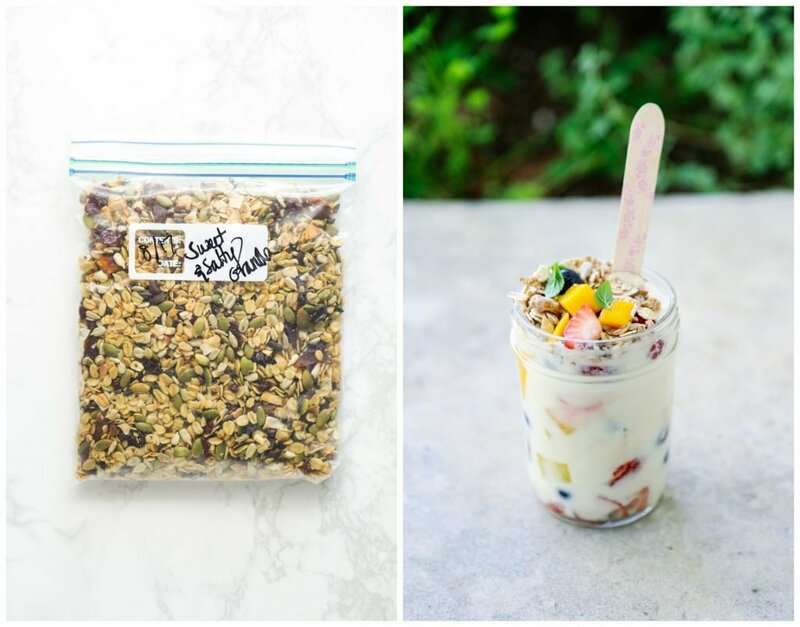 Granola bars will keep in the fridge for up to 2 weeks, or freeze them for up to several months. There’s no need to reheat granola bars since they’re best served at room temperature or slightly cold. If your kids go to a nut-free school, granola bars probably aren’t going to be a good option. Slice strawberries, apple slices, kiwi, mango, and orange slices in advance. Sliced strawberries keep best in a paper towel-lined container. Apple slices should be tossed with lemon juice (or sprinkled with cinnamon) to keep the apples from browning–they’ll only keep for 1-2 days in the fridge. Store sliced fruit in glass containers or mason jars. 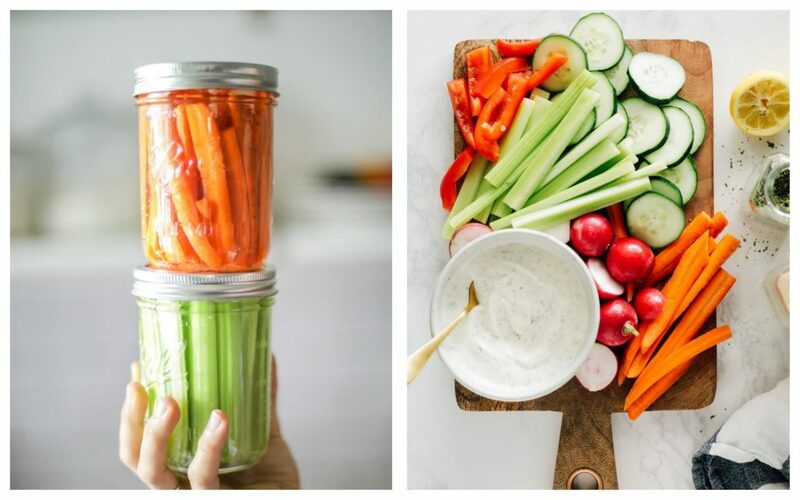 Store cut carrot and celery sticks in mason jars, filled with water. The water keeps the celery and carrots from drying out during the week. Change the water every couple of days. The celery and carrots will keep, in the fridge, for up to a week. Slice bell peppers (or mini sweet peppers) and store the slices in a mason jar. Slice cucumbers and store the slices in a paper towel-lined container, but only for 2-3 days. Snap peas are an option that doesn’t require any chopping, just rinsing. Dips are a fun side for veggie sticks, pretzels, pita slices, quesadillas, and tortilla chips. There are some great store-bought dip options available: Eat Wholly Guacamole, hummus (I love Hope brand), various salsa brands, Primal Kitchen Dressings, and Tessemae’s Dressings. You can also go the homemade route and make a dip for the week ahead. Store homemade dips in the fridge, in a mason jar or storage container, for up to 5 days (depending on the expiration of the ingredients). Ranch, Guacamole, Hummus, Honey Mustard, master vinaigrette salad dressing (for a pasta salad or a side salad). Great post! 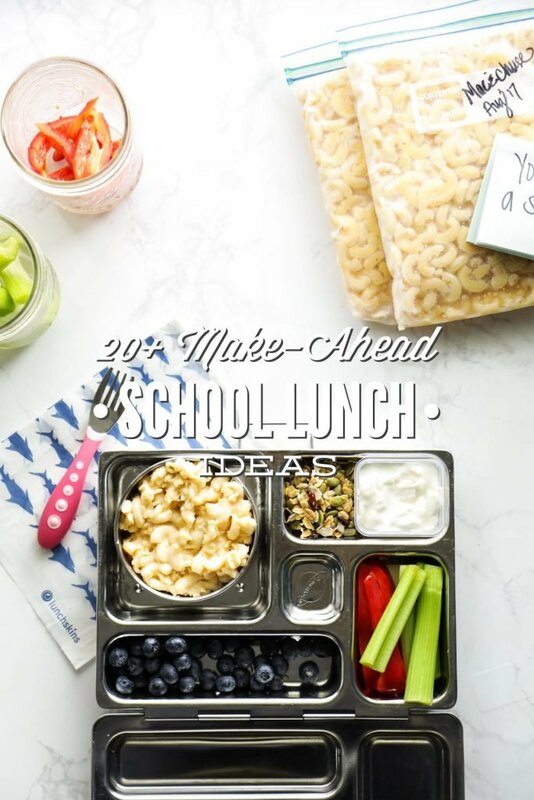 How do pack the lunches though, specifically warm foods like mac & cheese? If it’s in a thermos does it really stay warm until lunchtime? What about the bean burritos, do your kiddos mind them cold? Thanks! Hey Karli, Thank you. For warm foods, like mac and cheese and soup, I use a thermos (here’s my gear: https://livesimply.me/2016/07/29/school-lunch-gear-real-food/). To keep food hot, I fill the thermos with hot water, and let the hot water sit in the thermos with the lid on for about 5 minutes. Then, I dump the hot water out and fill the thermos with hot food. This keeps the food in the thermos warm until lunchtime. For other stuff, like the pizza bites or burritos, they eat them at room temp. I pack these items in the morning, so by 11:30 (their lunchtime) they’re room temp. You could probably put these foods in a thermos, too, just cut the burrito in half and maybe wrap it in parchment paper. You could stack something like pizza bites in the thermos, too, in between maybe parchment paper to avoid the cheese sticking to the bottom of the next pizza bite. For out 1-1 time while her baby sister sleeps so thankyou ?????? Thank you so much, Charise! 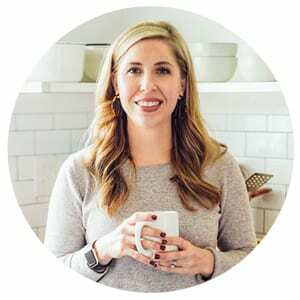 I’m so glad you’re finding the recipes and blog helpful. THanks for all these great ideas and the photos are definitely helpful. 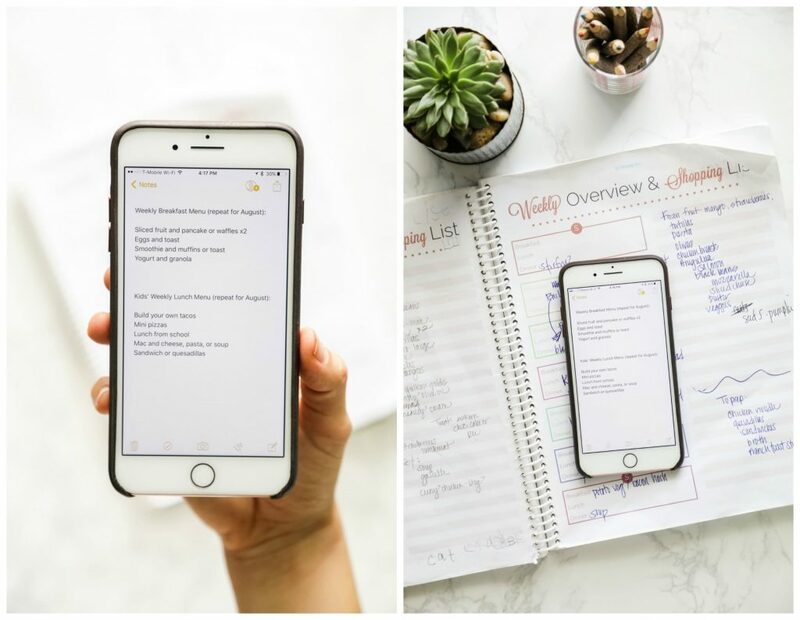 We are a busy family of 5 and I definitely want to step up my kids school lunch game so I plan to implement a lot of these! 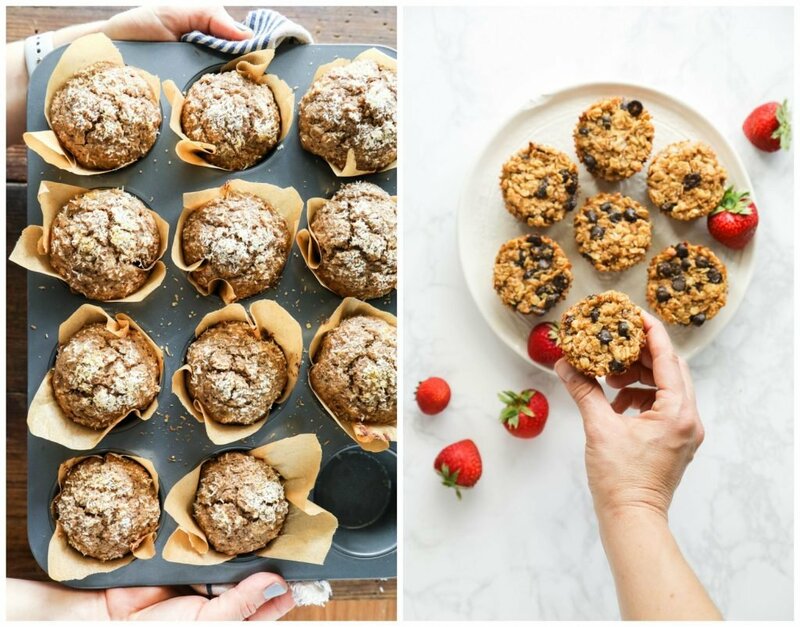 Where can I find your oatmeal muffin recipe? Thank you again!